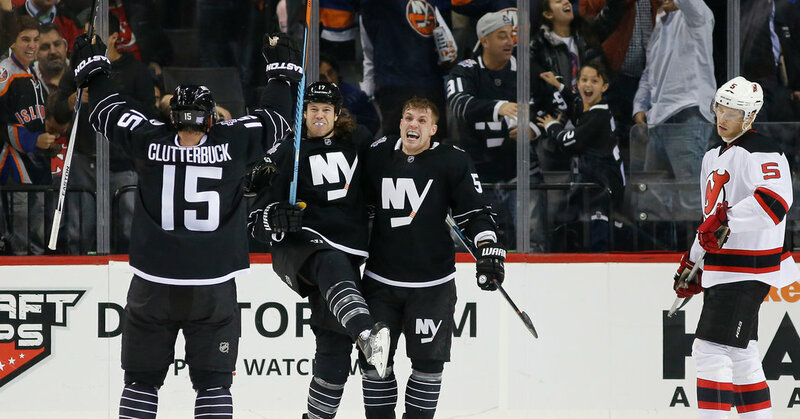 The New York Islanders black alternate jersey is one that I actually like. Now, I know many don't like it, probably because it's such a shift from their regular kit, which is one of the reasons why I like it. However, I do believe some changes need to be made. For reference, here is the current Islanders alternate. Now, there's a few thing that bug me about this uniform, despite loving the idea of it. First, I think the Islanders are an organization that seems to embrace their past rather than their future, with their future being Brooklyn (probably.) With that in mind, I wanted an emphasis more on "Brooklyn" (without the element of hipsters) than I did on the New York Islanders of 1980-1984. Namely, the striping changed from four skinny stripes to three thicker ones. I also eliminated the "NY" on the pants and replaced it with the "BKLYN" logo that the Islanders have on their alternate helmets (which I strangely love.) I also decided to adopt the Brooklyn Nets font for their names and numbers. The collar has been changed to a more traditional style instead of the "black AND white" style collar they currently use, or whatever you want to call it. I kept the side jersey tags with the "B" logo on them, since I do love them. 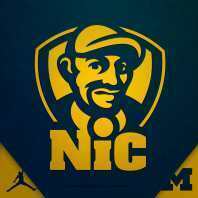 I updated the jersey style to Adidas, because why the hell not? Anyway, here it is. C&C is welcome as always. I'm working on a number of alternates for different things, so hopefully I can inject the "Concepts" forum with more of my work. I love the fact that you're looking to change this, because I know for a fact that this is something that isn't loved by most Islanders fans. Although I understand the fact why you used the Brooklyn Nets font, this does just look like you put a Nets jersey style on a hockey jersey instead. In my opinion, try and make this more original and maybe use another font to make it more unique. I agree with Bronco Boy. To me, it looks like a Nets/Isles mash-up jersey. Maybe just elevate that logo you have on the breezers to the jersey. If you arch it, you could still have your front numbers. Good look overall tho, the rest is a definite upgrade. This was under consideration before Reebok stepped in and took over the design process. Version 1 The BKLYN was going to be added if the design process was further down the road. Reebok controls the process since they take the financial burden. 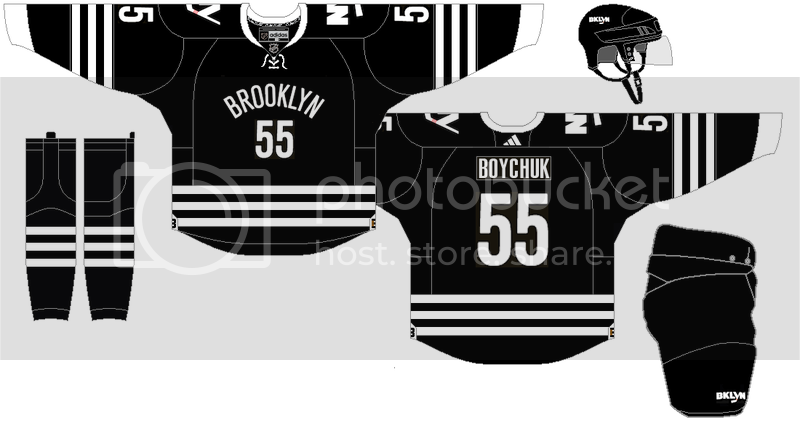 The final Islanders black alt. jersey would be the most attractive practice wear jersey in the league. The black and white is too dull. -The helmets were going to have a black stripe down the center of the helmet but the NHL has all kind of rules re: equipment dress. Each thread is for the original poster's own concepts. Honestly, attached is all you could come up with? These dress up your page quite nicely... :-) Mulligan accepted. I would prefer it if you used a logo over the script but the striping is a huge improvement. Shame they didn't use that fishbone pattern on the pants.